A few years ago, I started posting about science publicly on Google+. I did it in my spare time because as a scientist, it was obviously a topic I was interested in. I also found the public ignorance about science particularly depressing. This, coupled with a woeful misrepresentation of science on the part of many science journalists on popular media meant that even if the public cared enough to read about science, they would be ill-informed by sensationalised over-hyped articles. There was only one solution, as I saw it – the scientists themselves should engage directly with the public. This has always been my personal motto when it came to doing science outreach. A high K-index indicates that the scientist may have built their reputation on a shaky foundation, while a low K- index indicates that the scientist is not being given credit where credit is due. An unfortunate consequence of the K-index is that it is damaging to other scientists who genuinely engage in science outreach on social media. Scientists are evaluated by their publication records. People who have a low K-index will likely be older and well-established. Someone who started publishing 30 years ago and just joined Twitter will have a very low K-index. On the other hand, early career researchers who haven’t published a lot but engage in outreach can appear to have a high K-index. The author also advises people that “if your K-index gets above 5, then it’s time to get off Twitter and write those papers”. Never mind that only 1% of scientists regularly publish one paper a year. Do we really want the other 99% of scientists to stop writing about science on social media? I understand that this paper was ‘semi-serious’. I understand that there are certain science outreach ‘personalities’ on social media who regularly over-estimate their popularity and importance. But I can already imagine how this index can be used to patronise young researchers who engage in outreach. I can imagine the smirks from senior scientists at job interview panels and evaluation committees. This ‘joke’ article is only funny if you are a senior tenured professor with lots of papers and yet have a low follower count on social media. “Ha ha, let’s laugh at those silly scientists doing social media outreach when they should be writing papers!” The K-index trivialises those of us who work hard to communicate science with the public. I don’t earn anything from doing outreach. It doesn’t benefit me professionally. I don’t have better job prospects because I have an audience. I do it because as a scientist, I feel I have a duty to directly engage with the public. Doing outreach doesn’t harm me either. I hate to think that someday, it might. I hate to think that I might be taken less seriously because I do this. I especially hate to think that other young researchers might be discouraged from engaging in outreach because of this. Thanks to Tommy Leung for the discussion that inspired this post. Image: Twitter followers versus number of scientific citations for a sort-of-random sample of researcher tweeters. 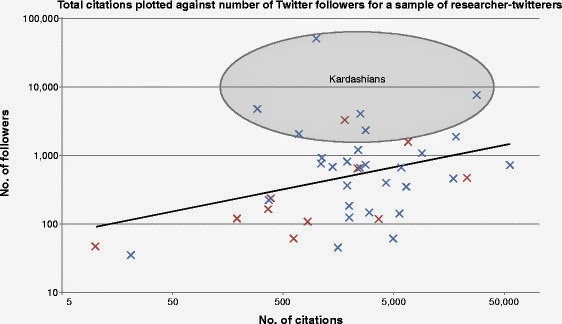 Individuals with a highly overinflated number of followers (when compared with the number predicted by the trendline) are highlighted by the area labeled Kardashians.